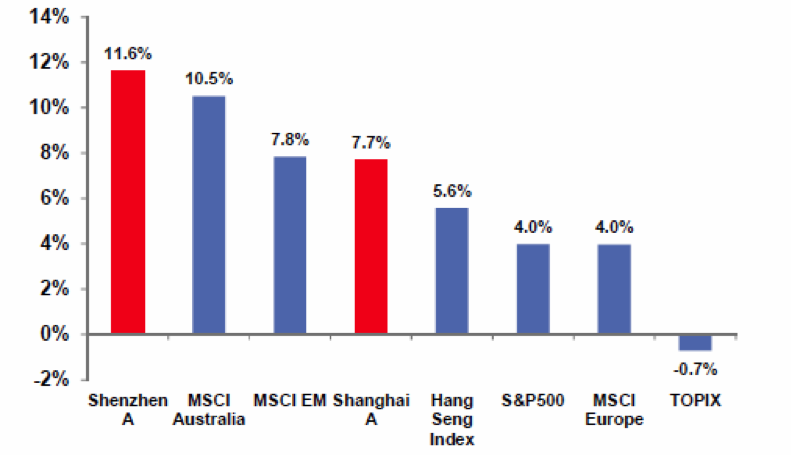 Europe is fixated on every data point out of Germany, and Asia (and Australia) watches China like a hawk. These two countries have more in common than is sometimes supposed: both countries are at the centre of regional trade blocs – Germany in Europe, China in Asia. While both trade on a global basis, they share a dependency on their backyard regions. Germany’s exports were equivalent to 50% of its GDP in 2013, according to the World Bank. China’s exports equalled 24% of its GDP. The US, by comparison, exports only 14%, and Australia 20%, of its GDP. Both China and Germany have created production systems that outstrip their capacity to consume, hence their vulnerability to the appetite of their customers to grow demand. For Germany, its primary market is the rest of Europe – leaving it exposed at a time when European economies are struggling to grow at even 1% per annum. On Tuesday, the European Commission revised down its growth forecasts and predicted more of the low inflation and high unemployment that plagues the bloc. The euro zone’s economy is now expected to expand 0.8% this year, 1.1% next year and by 1.7% in 2016. For China, there is more demand, but much of it is among the roughly billion people who lack the purchasing power to buy the goods China produces for the regional and global market. … Economic viability for both Germany and China depends largely on maintaining exports. No matter how much they import, their exports maintain domestic social order by providing a significant source of jobs right away, rather than in some future scenario involving the rebalancing of their work forces. For Germany, which has memories of massive social dislocation in the 1920s, maintaining full employment cuts to the heart of the country’s social order. For China, whose Communist Party was shaped by the rising up of the unemployed in Shanghai in 1927, maintaining full employment is a bulwark in defence of the government. Both countries look at unemployment not only in terms of economics, but also in terms of social stability and governmental survival. Therefore, exports are not simply a number, but the foundation of each country.” (Stratfor, Geopolitical Weekly, 21 Oct 2014). 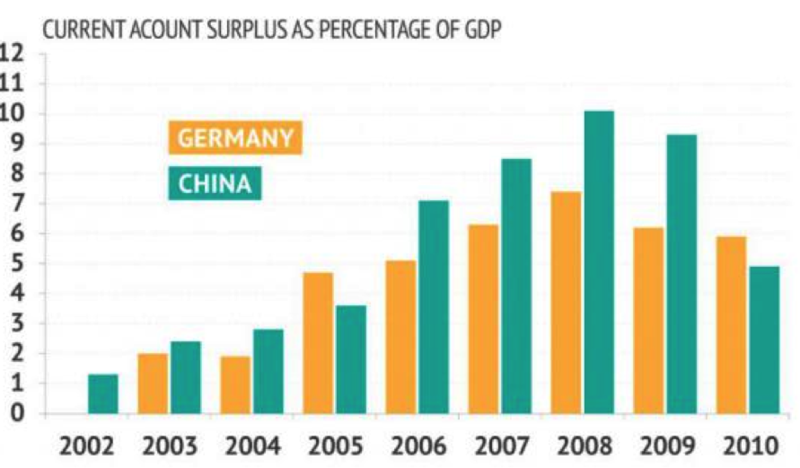 China’s problem is different from Germany’s, if somewhat more hopeful in the long run. The 2008-2009 global financial crisis decimated China’s low-end export sector. The crisis halted the decades long export boom that the Chinese government had kept alive well beyond its natural life span through years of wage repression and wasteful subsidies to manufacturers. As a result of the crisis, the portion of China’s GDP tied to exports collapsed almost overnight, from 38% in 2007 to 24% now. This collapse has forced President Xi Jinping and his predecessors to rely on the expansion of state-led investment into housing and infrastructure construction. But now, the housing boom is showing signs of tipping over. Beijing is pinning its hopes, in part, on a revival of China’s export manufacturing might – not of the low-cost, low-value added goods that were once the country’s mainstay, but increasingly of the kind of value-added goods produced by more advanced export economies such as South Korea and Germany. However, this evolution is a long-term goal, not one that can be realised in a short few years. In the meantime, Beijing will struggle to maintain stable growth and high employment in the face of an anaemic export sector, a deflated housing and construction bubble, and tepid domestic consumption. Real growth in China slowed to 7.3% in the third quarter. Recent data points to deflationary risks from the overheated housing market, booming shadow banking system, and vast overcapacity. Inflation slowed to 1.6% in September, and money supply growth suggests there is more room to fall; new bank lending has slowed along with shadow finance liquidity; and production, consumption, and investment data all continue to slow. No country is immune to the business cycle indefinitely. Policymakers are actively trying to support the economy, and they have the wherewithal to support their initiatives. And unlike the various European countries struggling inside the straitjacket of the euro, the Chinese have the flexibility of the Yuan to act as a shock absorber if need be. Before he became Premier, Li Keqiang apparently said he had little faith in China’s official GDP figures. He suggested using three alternative indicators: electricity consumption, rail freight volumes and credit growth. 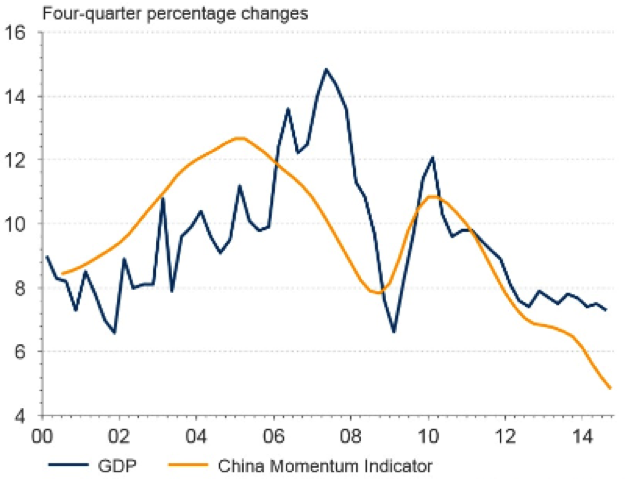 Thomson Reuters have constructed a “China Momentum Indicator” (CMI). It does not look good for China’s growth prospects. Before we get too gloomy about China’s prospects, it may be worthwhile considering the track record. Despite the risks inherent in a shifting and transforming economy, China’s leaders have been adept at maintaining growth at high levels and meeting challenges in creative ways. Investors who have bought into the China growth story since the turn of the millennium have done relatively well (see chart below). This entry was posted on Thursday, November 13th, 2014 at 9:57 am and is filed under Weekly Investing Report. You can follow any responses to this entry through the RSS 2.0 feed. Both comments and pings are currently closed.